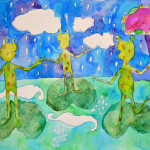 Susan and I are seeking kids’ frog art—lots of it! We hope to encourage kids and their teachers to learn about and get interested in frogs, toads, and other amphibians. 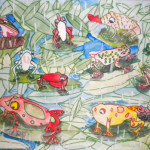 If you’re an elementary school teacher, parent, or educator, please send us jpegs (2mb maximum size) of your students’ or kids’ drawings or paintings of frogs and we will display them in school group galleries on the FROGS ARE GREEN blog. We’d be happy to receive images of any art form—sculpture, drawing, painting, or watercolor. If the art work is part of a school project, please send the jpegs in one bunch. Individual drawings not part of a class project are fine, too. Include the name of your school, state, country (if not the U.S.), grade level, and child’s name for each piece of art. Language arts. 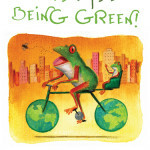 As we’ve posted before, there so many wonderful children’s books with frog characters. Click on Literary Frogs on the right to see a few. I plan to review more titles in the coming weeks. Rainforest unit: Rainforest frogs are some of the most colorful and interesting animals in the rainforest. Endangered animals: Almost one-third of all amphibians are threatened with extinction, yet most kids probably don’t know this. Pick an endangered frog or toad and learn about it. Local flora and fauna: Learn about the frogs and other amphibians in your area, and also learn to recognize their calls. Life cycle of animals: Many state science education standards require children to learn about the life cycle of animals. Frogs have one of the most interesting life cycles—from tadpole to froglet to frog. Below I’ve posted two YouTube videos about how to draw a frog. One is simple line drawing, and the other is more detailed, for older kids. This entry was posted in Learn about Frogs and tagged amphibian education, children's art, children's art and frogs, children's artwork and frogs, children's books about frogs, drawing frogs, endangered frogs, Frog Art, frogs and art, frogs and education, frogs and language arts, how to draw a frog. Bookmark the permalink. I found your website by mere chance and I think it is SO-O-O COOL! It’s a great learning resource, too. I hope you will get a lot of frog pictures in the near future. Anyway, I will certainly contact my daughter’s art teacher with this idea. You all are doing a wonderful job. Many thanks. Thanks so much, Natallia. We’re so glad you like the blog! We really appreciate your comment. Thanks for your comment! Glad you liked the post! Oh i must say your blog is nice.really frogs and all animals are very cute.its really nice that your blog have a different subject.your blog theme is also very nice.